There are enough instances of unfair and counterproductive "Palestinian passes" to fill a tome, but here are some recent examples. Probably the most important pass currently given to the Palestinians is the global silence over news that Hamas is preparing to launch another war against Israel while distressing ordinary Israelis with their ominous tunneling sounds. Such silence by the world's most important media, international bodies, political leaders, NGOs and academics helps keep Hamas in power, and when Hamas eventually launches new hostilities against Israel, many of the same voices that are now silent will blame Israel for the resulting suffering. Hamas bellicosity is constant, and constantly ignored. Rather than prepare Palestinians for peace, Hamas glorifies death and promotes viciously hateful ideologies. A Hamas TV broadcast announces, "We have no problem with death. We are not like the children of Israel...we yearn for death and Martyrdom...Every mother...must nurse her children on hatred of the sons of Zion." Ironically, those who claim to excoriate Israel out of their concern for the welfare of Gaza don't seem to care when Hamas causes Gazan suffering. At least 160 Gazan children died digging Hamas' tunnels intended to kill Israeli children. Hamas tortures political prisoners next to a girl's school and kills its critics (it executed 25 in 2014). Hamas executed 120 Gazans for breaching a curfew. Hamas kills fellow Palestinians when its rockets fall short. Unsurprisingly, in a poll last September, Gazans actually preferred Israeli rule to Hamas. Facebook tolerates Palestinian incitement but quickly responds to complaints about Jewish racism. The company is clearly able to control the threats circulating on its site, as shown by Facebook's recent decision to stop gun sale promotions, making the continued incitement against Jews and Israelis on Facebook all the more outrageous. Facebook has much to learn from its tech rival, Google, which is reportedly directing jihadi search queries to sites that deradicalize. Global opinion seems indifferent to how incitement (including in Palestinian pop culture) contributes to Palestinian violence. Instead, United Nations Secretary General Ban Ki-Moon blames Palestinian terrorist attacks on Israeli policy (settlements), which is like blaming the November Paris attacks on France's policy against Islamic veils in schools (ironically, Israel actually allows such veils in its schools). When Israelis kill knife-wielding Palestinians in self-defense, Sweden's foreign minister calls for a probe into Israeli "extra-judicial killing," but she was conspicuously silent after French police preemptively killed a machete-wielding Islamist trying to hack them in a Paris police station. Those who claim to want Israeli-Palestinian reconciliation should recognize that pressuring only Israel actually reduces the prospects for peace (as an architect of the Oslo Peace Accords observed about the Obama administration's fruitless efforts). Unfortunately, France is repeating Obama's mistakes with its latest threat to recognize Palestine if Israelis doesn't make enough concessions to those trying to stab them. A CBS News headline last week provided a classic example after gunmen attempted a terrorist attack outside Jerusalem's old city. Three terrorists died after killing a 19-year-old policewoman. The headline? "3 Palestinians killed as daily violence grinds on." Thankfully, the network apologized and changed the headline. But the original version would have been akin to a 9/11 headline saying, "19 Muslims Die in Plane Crashes." A corollary of the pro-Palestinian pass on negative coverage is passing on positive coverage of Israel. There has been virtually no mention of Israel's disproportionately generous humanitarian aid efforts, or its exceptional contributions to solving global problems relating to health, energy, agriculture, security, (as Israel has done in Africa). If the world knew just how important Israel is to solving some of the planet's toughest problems, and how Israelis can also be victims of war and terror, global opinion might be less judgmental and more protective of the only democracy in the Middle East, as the tiny Jewish state does its best to survive in the world's toughest neighborhood. All of these types of passes grow exponentially worse whenever war breaks out, usually after Hamas launches one too many missiles at Israeli civilians. 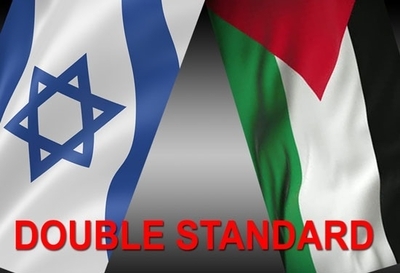 When Israel can no longer accept about 40 percent of its population living in range of deadly rocket attacks and finally does what any normal country would do – take military action against those attacking it – the global media bias moves into overdrive, enabled by "Pallywood," journalistic malpractice, and fear of Hamas retribution. Casualties inevitably mount, especially thanks to Hamas's unethical use of human shields, emotions run high, and media outlets compete to get "breaking news" out first, resulting in less time to check facts and more groupthink pressure to favor the perceived underdog. The media slant then exacerbates the bias from world leaders, international bodies, NGOs, academics, and anti-Israel boycott movements. Thus, with each war, Israel gets more demonized while Palestinians are increasingly presented as blameless victims. Tragically, these biases actually perpetuate the conflict. Those who genuinely want peace should focus global media attention, lobbying, and resources on Palestinian intransigence and Hamas' obsessive focus on attacking and trying to "destroy Israel."